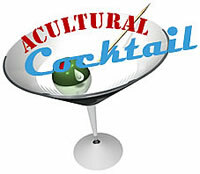 Acultural Cocktail was bracing, high-octane virtual chatter about Edmonton's lively arts scene. It was broadcast live on Fridays from 5:30pm to 6:00 pm (Mountain Time) on CJSR FM 88.5. The inimitable hosts were Gilbert Bouchard and Suzette Chan.